Warning: This is a long read. Either grab a coffee and be prepared to delve into the depth of a very personal reflection, or skim the subtitles and read what appeals to you. This has been a tough month emotionally for me on many levels. I am now “In Search of Valerie!”. I have become somewhat reacquainted with the physical “me” I used to be and the confidence and excitement that washed over me through that realization were invigorating, revitalizing and hauntingly familiar. This new thrill has arrived solely as a result of “me” emerging from within as I shed my old body image and begin to reclaim the “me” I used to be through the process of my former image beginning to reappear. My ability to fit into some of my clothing from my “normal” days where I was confident and self-assured turned the switch on my entire focus this month. As I pulled clothes off the rack in my downstairs storage closet, trying on blouse after blouse, and jacket after jacket, flinging each on the bed in the “almost fits pile” or the “did I really ever wear that pile?”, that surge of confidence washed over my being. Familiar, yet foreign. Exhilarating, yet terrifying. No longer supple well-toned skin or golden streaks of curly hair. I stood grey, aged and red-lipped, with a confident nobility surprising even me. Yet lacking the youth and sensuality that empowered my “previous presence”. My focus this past eight months has been entirely on my health. Losing weight was a bonus. The weight loss was what other’s noticed, but it was not the centre of my universe or my reason d’etre. Until now. Now, all I could do was imagine. Imagine fitting into this. Imagine looking like that. Is it possible to look like this, again? Or that? Imagine! It was possible. From where I had come til now. So very possible. The end of last month I was down 66.5 pounds. The end of this month I have lost a total of 71.5 pounds. This was the hardest 5 pounds I have lost on this program. I was relentless. I was very focused. I was determined. Only 5 pounds? Such torture. 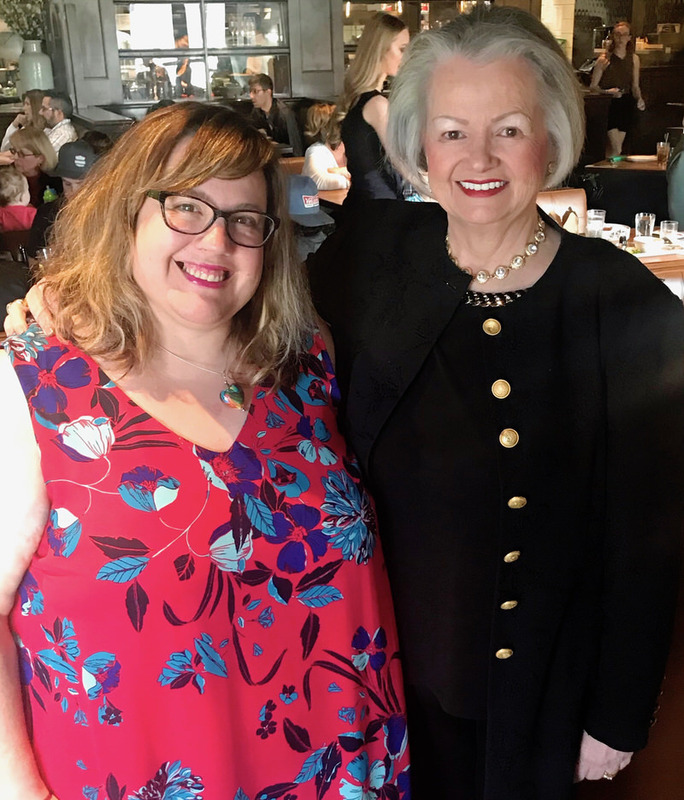 Feeling as fabulous as I had through the Evolv Health Total Reboot Program, that “fabulous” was starting to feel “normal” and I had to really focus on remembering how I used to feel as I was losing sight of the real prize. What a month! Never again. Oh, I learned so very much. Over this emotional hump for sure, but it wasn’t painless. Time will write my history on its wall, and I hope there will be evidence I have learned from this. 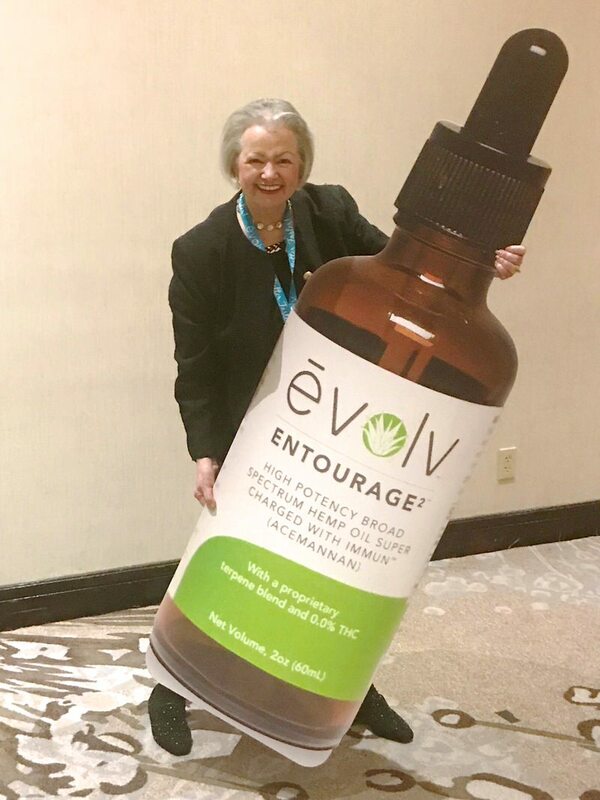 At the end of March I went to the annual Evolv Health Conference: Impact 2019 in Dallas. 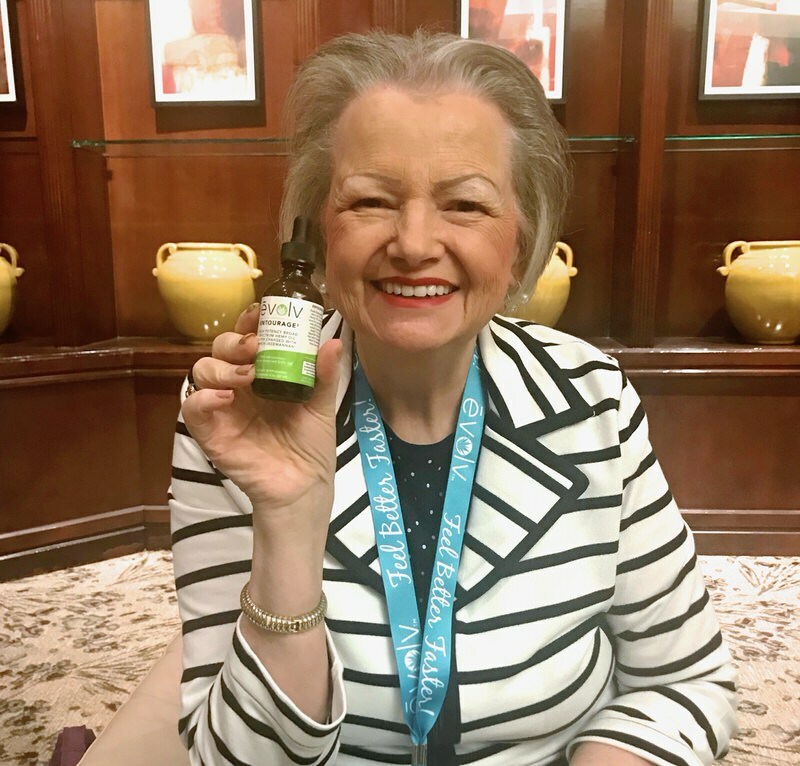 I had been to my first Evolv Health Conference in Chicago last October for the launch of the new hormone product, Balance. Why did I go to the first one? The products from this company changed my life in ways I was completely convinced were impossible, and as a life long learner, was compelled to learn more. Why did I go to this conference? I now belong to the “Church of Evolv Health”. The products have not only changed my life but my daughter, Ragan’s, my husband’s and others that I have personally witnessed. I now believe in the integrity of the owners, leaders and Scientists within this company. And, there would be another new product launch: Entourage2 (entourage squared). It has been in development for several years and it is Evolv Health’s Hemp Oil product. Am I excited? Yes! Why? Every other product has made a significant change in my health for the better. The trifecta is the Fix, Balance and Entourage packaged in the Feel Better Faster Kit available only in the USA at this present time. However, I had the opportunity to see it and try it at the conference. As it just happened and is an integral part of Project 2019 Reboot Your Gut Health for me, I am telling you about it in my monthly reflection. *Throughout the 1990s and early 2000s, the processing of stabilized Acemannan changed very little. Then, in early 2005, the discovery was made that only specifically-sized fractions of Acemannan (Aloe vera’s bioactive molecule) were small enough to be absorbed directly into the blood stream, and other slightly larger fractions actually facilitated the plant’s amazing immunomodulatory effect. The larger fractions of Acemannan are converted to short chain fatty acids that provide additional gut health support. 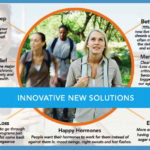 With this new information, Dr. Santiago Rodriguez, one of the world’s leading experts on Aloe Acemannan processing, developed Evolv Immūn, a revolutionary new Aloe Vera extract with a proprietary concentration of these immune activating and bioavailable Acemannan fractions, offering consumers an effective, non-toxic integrative health strategy for supporting the body’s normal functions of defense, repair, and regeneration. I didn’t understand I was to take it sublingually as it absorbs into the bloodstream and works much faster. As it is water compatible, it can also be dropped into a drink, but then it goes through the digestive tract and that is a whole other story regarding effectiveness. It will have an impact but over more time. There is much more information in this Entourage Brochure March 2019, if you are interested. If you live in the United States, you can buy the Feel Better Faster Kit here, or you can send me a message and I’ll purchase it with you and show you how to save 10%. You would think at a Health Conference there would be lots of opportunities to find healthy food and to stay on my Evolv Health Total Reboot program. I knew this may not be possible as I found it very difficult to find the food I needed at the Chicago conference in October. I was far more prepared and packed my nuts and seeds, bars and supplements with some Fix and Fuel. I did really well Thursday, Friday and Saturday. Sunday I was flying home late. I was not prepared for no place to eat or buy healthy food after 1 pm on Sunday. It just so happened that after I got to my gate in Dallas, there was nothing available but fast food. Seriously. I had a long day ahead of me, was tired, overconfident and weak. I bought 2 big fat chocolate chip cookies. They weren’t even that good, but there was a little something about them that was appealing. Was it the evil of the cheat? The surge of the sugar? I could have bought a chocolate bar or chips. Was it the justification that a cookie was a healthier choice. (I bought two.) Six hours later I was in Minneapolis, and the same situation: a very small terminal with only junk food. Two more big fat cookies. They were tasty ones. Four big fat cookies and my first in over 10 months. Let me add this up. Two bars at 180 calories each and 4 big fat cookies at 840 calories for all 4 with a total of 1160 calories for the day. Not bad if I was counting calories, but that’s not how this program works. It is a program based on 50% fat, 20% carbs and 30% protein. I believe I just ate 100% carbs. I didn’t even put this food into My Fitness Pal and I weighed in the following morning a 6.5 pounds heavier that the day I left. Of course, I expected punishment, but this was a bit extreme. What a lesson. Walking. Back on the program and in three days, I am back on track. Were the cookies worth it? Heck no! Why do I have to learn the same old things over and over and over and over? Good news, it is the first time in 10 months. Lesson learned, again. What would I do differently? If I don’t know what to expect, don’t take a change. I could have ordered a healthy meal at the hotel and packed it in my carry-on. It may have cost more but it would have been worth it. Ragan and I continue to cook together every other Tuesday to pack away dinner meals for the three of us. She continues to drive me by keeping the evening meals for Vanja and herself creative, delicious and exciting. I have more recipes that I haven’t had time to post than those I have posted, so look forward to meatballs with spaghetti! Yes, spaghetti! We have discovered a very unusual Japanese root called Konjac which is very high in fibre and therefore good for the gut with 0 carbs, 0 protein and 0 fats. 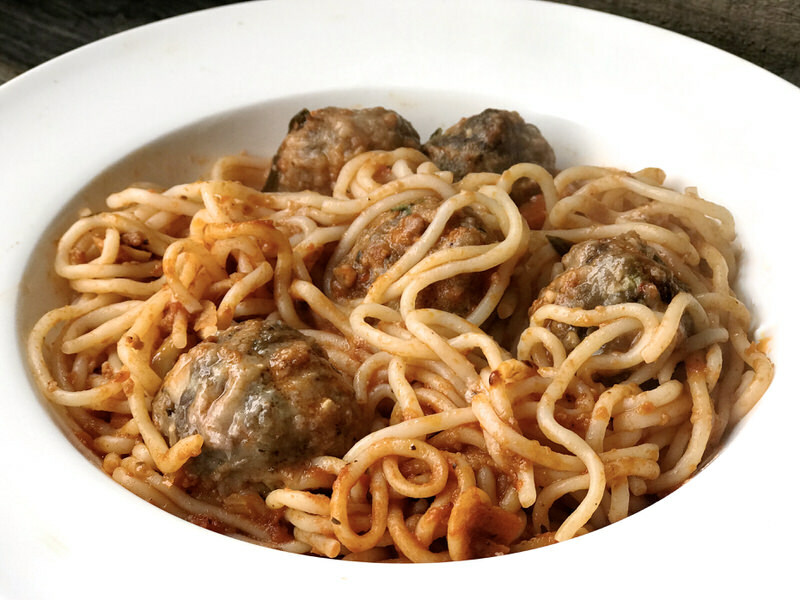 It makes for a darn good treat when craving spaghetti and meatballs! 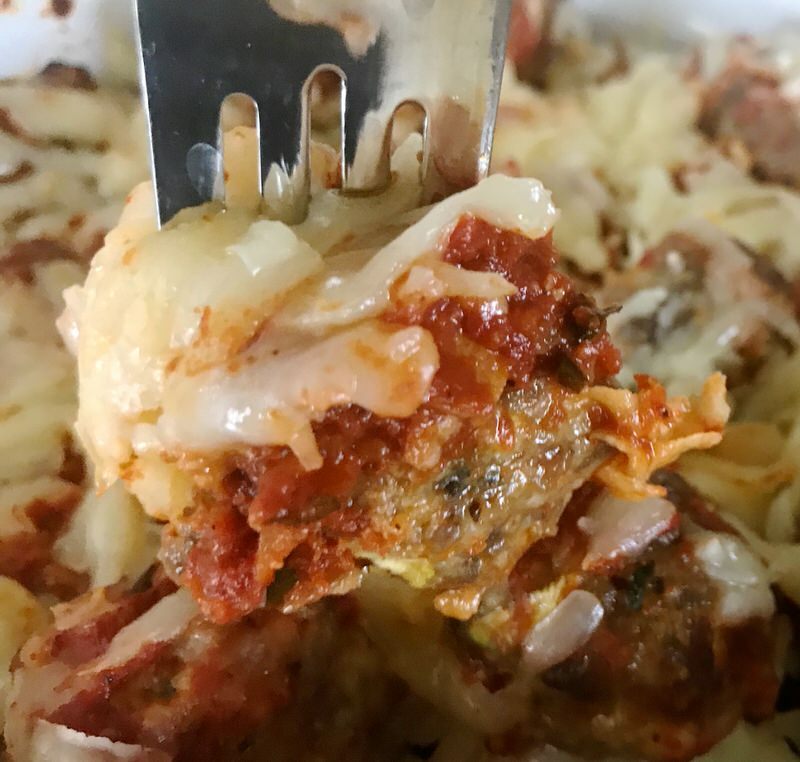 The Cheesy Reboot Keto Meatballs, below, to go with the NuPasta, above, are so delicious, easy to make a big batch in advance and a favourite recipe for all of us. Scrumpdilly-ishus! 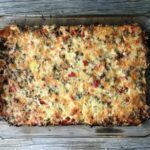 Keto Beef Zucchini Lasagna continues to be a family favourite. Mom loves it, too, and she isn’t even on the program. 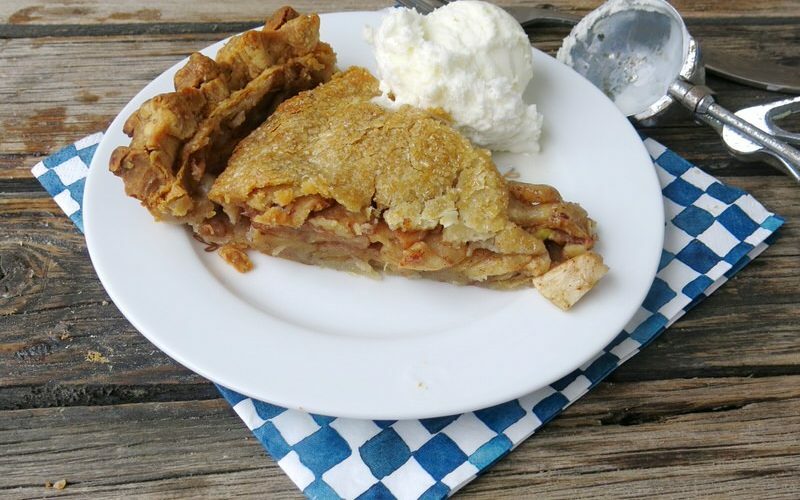 We have made it three to four times and double to quadruple batches each time. Always must have one in the freezer! 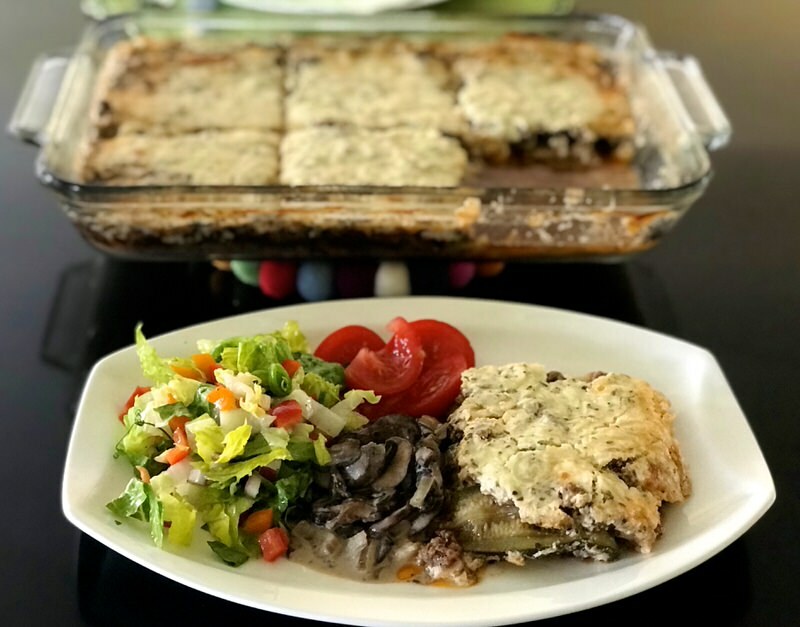 The salad and mushroom side dish recipes will be published in April, too. 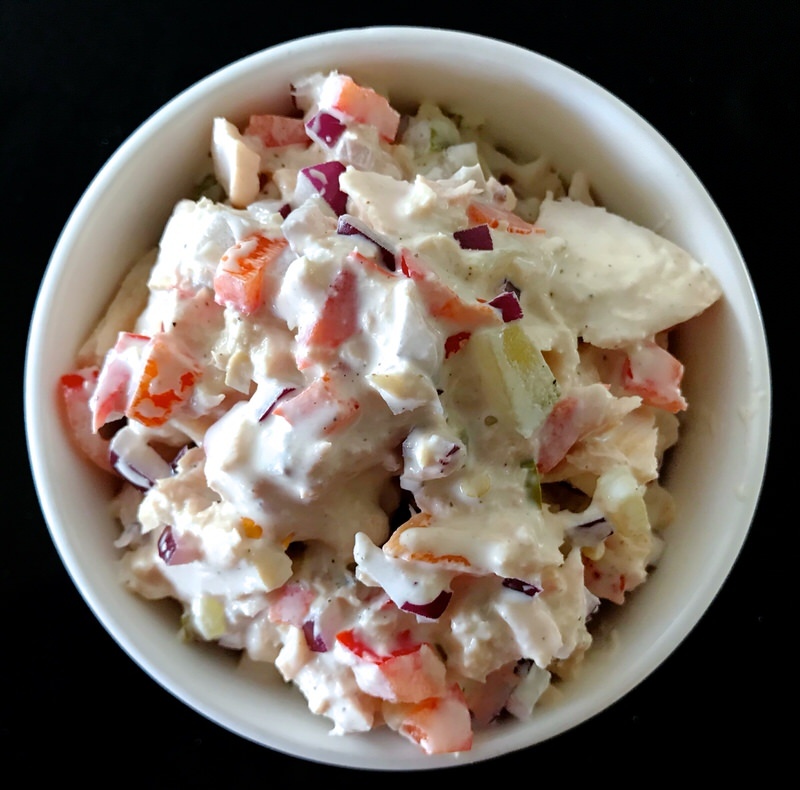 Tuna and Salmon have taken on a major role within my weekly menu this past month with Tuna Melt and Tuna Salad, either interchangeable with crab, shrimp or salmon which makes for a lot of yummy meals. I really enjoy these options and make the salad almost every other day now with some form of canned fish or shellfish. 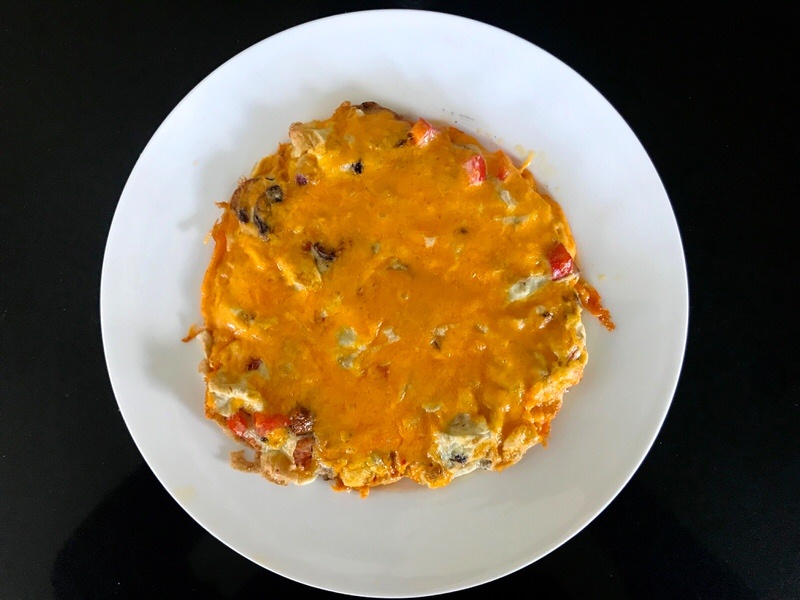 Vanja continues to have this for breakfast 5-6 days a week and it is delicious, nutritious, economical, very filling and very satisfying. “Spring has sprung, the grass has riz and no one knows what time it is!” would be a good summary of this month for three of us! Vanja had a great third month on the Evolv Health Total Reboot Program. His pain decreased dramatically, sleep increased and he lost 30 pounds. That’s a lot to celebrate. He has now begun the Impact Phase and had 2 meals of my homemade Cordon Blue, but didn’t veer too much off the program, otherwise. However, tonight we’re having company and I do believe he will be having his first bread with my Tomato Bruschetta in three months. I’ll fill you in on how that goes, next month. Ragan also had a dynamite month and is 1.5 pounds away from a 60-pound weight loss in three months! Whoo-hoo! She feels so very much better, sleeps better, moves with ease, the swelling in her ankles has completely dissipated and her pulmonary specialist almost had a party in his office when he saw her last. She also has asthma and was at 52 percent lung capacity her last visit. This visit she was at 105% capacity and will likely only need emergent care in the future. He is following up with her in two months. She had also had high hemoglobin which thickens the blood and could be a variety of issues. Sadly, her family doctor didn’t follow through on gathering her re-test results though she called and called. Had to do it again and the upside of that is that likely due to her improved health, her blood is completely normal. She is also walking a minimum of 3 kilometres 5 days a week, and I know that as I am right there with her. What a difference this has made at the onset of each of our days! Me? Oh my. I need to lose the 25 pounds glued to my torso. More would be nice, but I am being practical. You read about my struggles, above, already. I went from 66.5 pounds down the end of February to 71.5 pounds down the end of March. That is – count them – FIVE pounds. Thank you for holding the drum roll! I need to stop expecting more. Really, I do. Five pounds in a month is a miracle. It just seems harder now, the closer I get to my goal. And, as I have now felt pretty spectacular for the past 9 months, it is easy to take that for granted and lose perspective on my personal progress and the fact that I am still “getting there”! I feel I should get there faster for how hard I work, only because the weight loss has become a primary focus – which it was not, prior. I am deciding to be very happy with a pound a week lost. I have been a little worried about Diana and Janet. They are so far from the three of us and struggle, as we all do, but alone. Of course, we work to support one another, but the Saturday Morning Support Group Meetings haven’t seen 100% attendance in a few weeks now. I believe success is directly related to the support given and received. Things come up. Life happens… and when all is well, one tends to slip and take things for granted. I do it all of the time. The good news is we have all recommitted to make these meetings a priority and to keep on track. Diana was able to get back into the swing of things after month two found her floundering. Six weeks in with extraordinary results in health, feeling, sleep, clarity, weight loss and lowest sugar levels ever, she stopped measuring her food and using My Fitness Pal. She gained weight and wondered why, but knew why. She reached out. Bravo, Diana! We talked. She got back on track, started measuring recording and analyzing. She lost the weight she gained but is struggling in other areas now. Still hasn’t been able to get out for any exercise due to the weather and is finding herself sluggish and foggy. We are all meeting on Monday for a ReSet of this ReBoot! She is still in her third month. Janet has really struggled this month. Confessed to being “off program”. Gained weight. Didn’t disclose how much. Still committed to feeling better as her migraines and her body just hurts. She is in the US so just started Entourage2 yesterday. Of course, that is very exciting for all of us, as Diana has been reading the testimonials of those that purchased it pre-launch. Ragan, Vanja and I are all dying to implement it into our already robust healthy regime…. so we’re all living vicariously through Janet this month. As she also purchased the Integrative Health Kit with the Entourage2, I suggested she plug her nose and dive into her Fix, as well, for at least 7 days. She got it with her first Total Reboot Kit but didn’t like it, so stopped taking it. I explained the trifecta effect with the Fix, Balance and Entourage2 (The Feel Better Faster Kit) and she thought she would give it another go now that she has the Entourage2 as she is so desperate to feel better. I’ll let you know whether she did or not and how the Entourage2 affected her next month. I am headed to Salt Lake City in two weeks for little Eleanor’s second birthday. Oh, how I dream of those two littles and their snuggles and hugs. William used to call me “Gazm” when he was 2 and she calls me “Gammies”. So sweet. I will be far better prepared this time. I will take a carry on bag with my favourite SKYR yogurt. It is so high in protein and a daily staple for me. I will take cans of fish and some whole fat mayo. Lauren doesn’t buy it and it’s easy for me to get a small jar here. The rest will be fine as I will be prepared. I will take my nuts and my seeds and my bars and drinks and supplements. I don’t miss eating other things when I am prepared. I have my suitcase already stuffed with Easter treats for my littles and their mommy and daddy. I have presents for Eleanor from me and Aunty RaeRae and Deda and Great Grandma. I have a special Easter gift for William from Deda and lots of party favours and special little things. Oh, how I love being Gramsy, especially now. Now that I am bright eyed and bushy tailed and happy and vibrant and revitalized and, as one of my students said to me once: All new and fresh! Easter Sunday is mom’s 89th birthday. I leave Easter Monday so our dinner will be Saturday. We ill have a fresh organic turkey if we can (frozen otherwise) and a lovely meal. This will be the first time in my entire life that I won’t make the dressing to stuff the turkey. I might and I could, for mom, but will have to discuss this with the crew. Will it be a temptation? No mashed potatoes or gravy, either. Delicious turkey. Salad. Vegetables. 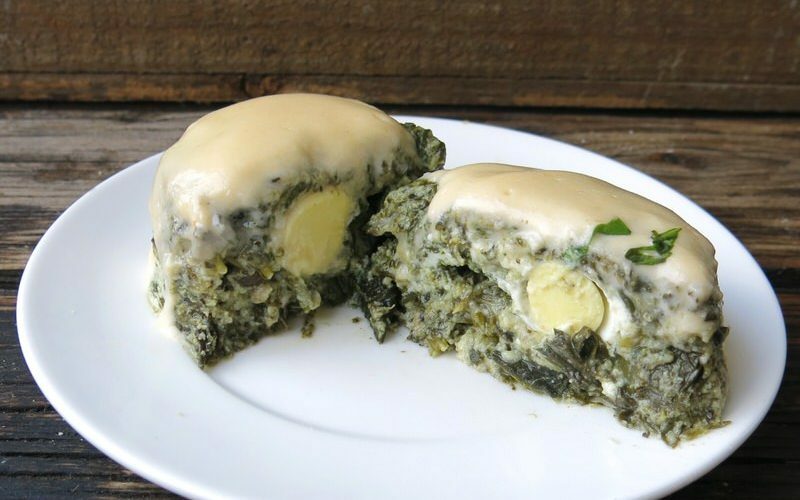 None of mom’s homemade prairie dinner buns. 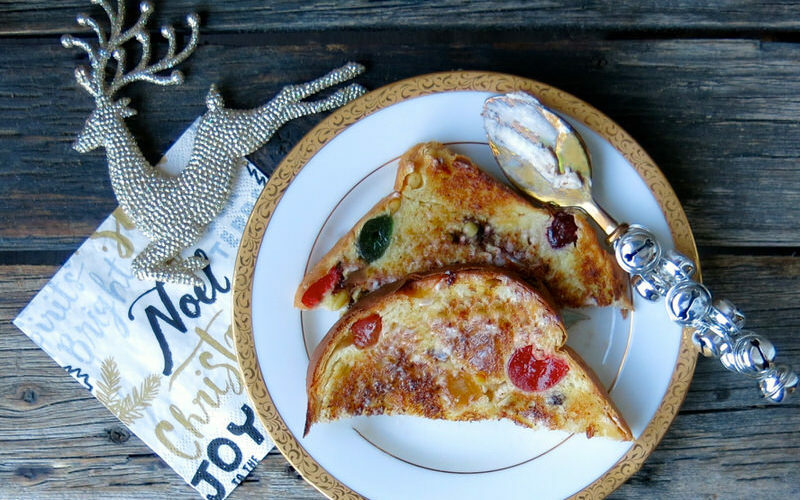 None of mom’s hot crossed buns. Not this year. 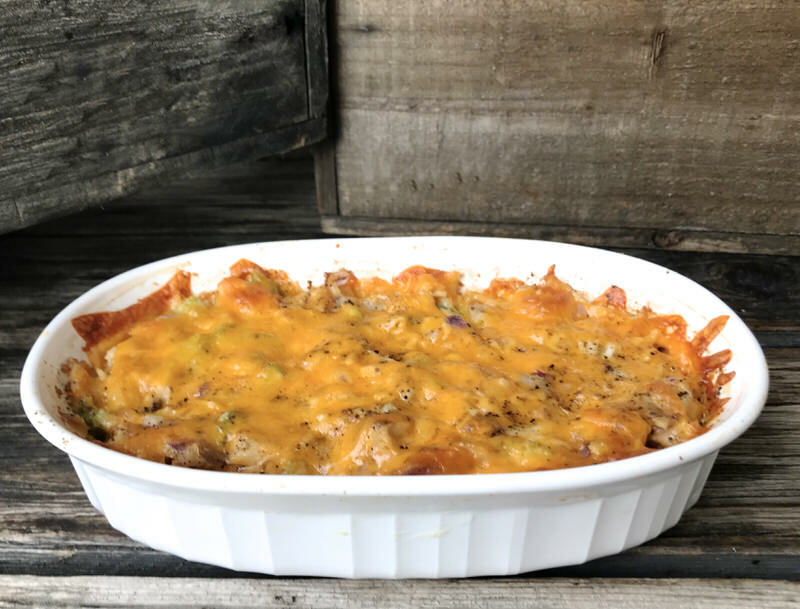 Other years, of course, I will make our beloved traditional meal with the belief that we will all be prepared for it and to enjoy it in smaller portions that our usual feasting mode. I cannot imagine all future Easter dinners being like this one but certainly can imagine only one small traditional recipe of each of those not being made this year in the future… as opposed to the double, triple, quadruple or more that we’ve made in the past when preparing for the holiday. In my humble opinion, everyone, even those most healthy, needs a Total Gut Reboot once or twice a year. Think of it as a 28-Day Challenge. Invest a little money, discipline and time in a healthy future. You are worth it. Again, ask Diana. Sugar and gluten-free for two years before her first Total Reboot and her blood sugars are now normal. A diabetic for over 40 years, this is a first for her. Eating gluten and sugar-free didn’t do this. The only addition to her diet was the Evolv Health Total Reboot Kit. plant-based proprietary GMO-free and organic supplements. 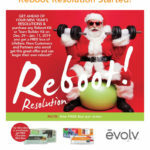 It happened because of the supplements in the Evolv Health Total Reboot Kit. The greatest contributor to me being off all of my medications and feeling as revitalized and youthful as I do is the combination of these whole food supplements coupled with the healthy eating that has brought me from a malnourished, lethargic, morbidly obese, sedentary woman to a fierce force filled with hope and gratitude! January 2019 update introducing Evolv Health Project 2019. I saw my Pulmonary Specialist in March. He was the final benchmark for my progress prescription medicine-wise. I am only taking Synthroid now for my Hashimoto’s Disease and off the myriad of other medications I was on for the other illnesses I had acquired the past few years which you can ready about here. I had not had my lung test for the new benchmark since being off all of my medications and was a bit worried my doctor might be a little upset with me even though I knew I was doing so much better. I should have known better as he had set me down a year prior and lectured me on reducing my medications. Reduce? Never! At that time, I always had a minimum of 6 months supply and would be sick to my stomach at times worried that one of my pharma producers might run out of what I needed. He was delighted. My lung test was lower than previously, but it was excellent considering I was medication free. So, he prescribed one puffer. I am off the other two, and the pill and the Xolair which is 3000 a month shot in each arm every other week. I am so grateful. He will follow up in two months, but I will not fail myself on this one. I will not.